With DIGITAL DINING’s Reservations module, your hosts no longer need to “look or the book” or scribble notes on pieces of paper. DIGITAL DINING Reservations helps you take reservations faster while eliminating guesswork and reducing mistakes. Pending reservations instantly appear on the host register’s wait list. Thanks to its complete integration with the restaurant POS system in North Charleston, hosts can control tables and availability times without the hassle of double entries or transferred information. Special requests are no problem. Hosts can instantly check the availability of special requests, like ”a table for four near the fireplace.” And our extensive customizable reports allow managers to plan ahead to meet the needs of their customers. If a customer makes a request that is unavailable, the POS will notify you when you enter the reservation and automatically suggest other options. This allows you to inform customers and immediately offer alternatives that may suit them. Digital Dining allows you to define special events in the back office. When hosts create a reservation for an event, they simply select the pre-defined event from a list and the POS will automatically apply the event’s data to the new reservation. You can also include special instructions with each new event, which the POS automatically adds to each reservation. Digital Dining’s extensive definable reports allow you to filter and sort reservation information any way you need it. You can design reports that help you prepare for large parties, special requests, or special events. You can also use reports to analyze cancellations, “no shows,” and table information. You can define special requests, such as “smoking preference,” “special location,” or table types.” When hosts receive a special request, they can search for applicable tables by simply selecting the predefined request from a list. Also, you can attach miscellaneous notes to a reservation to remind the host of any extra information when the guests arrive. 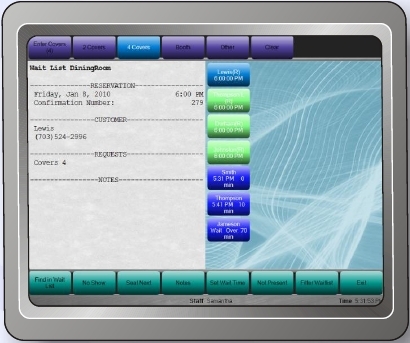 The Reservation module works hand in hand with the Table Management module, the Host Register, and the Wait List. This allows the POS program to access a customer’s information from other sources (such as frequent diner records or house accounts) and apply it to a reservation. When a customer is seated, the POS automatically applies the customer’s information to the new check. The customer’s information (name, frequent diner number, or special request) follows the entire transaction, from the reservation to the table to the final payment.